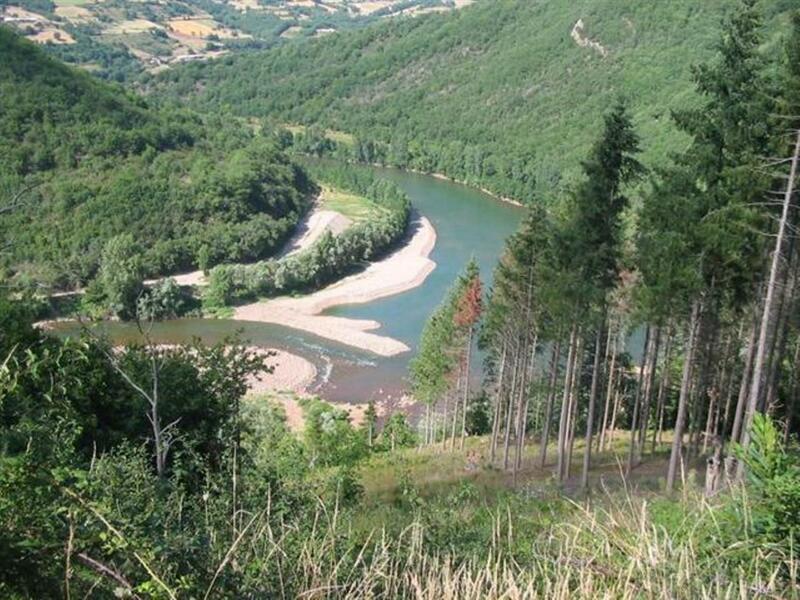 "Active" cycling tour along Tarn river between Albi and Millau, so almost flat if you want or hilly if you prefer on the hills (slopes of the valley) from 300m alt. up to 700m. 6 - 8 days cycling tours along the 1937 railway line along Tarn river. Self guided cycling hotel-tour with baggage transfer. Suited for family and youngsters 14 years and older. Standard ** packages: ** hotel accommodations, some with a pool. You can start this tour any day of the week between March 15th and October 31th. Many opportunities for canoeing and swimming in Tarn river. Start and end in Albi. Not included: Lunches. Price of lunches (take away picknicks) : 8 - 11 EURO. Not included in basic rate: Bike rental, electric bikes can be rented too! Important group discounts for parties from 3 to 8 persons (10 tot 23 %!). When biking the whole old railway line up to St. Affrique (8-day tour) you will ride past 6 railway bridges and through 10 railway tunnels. For holiday makers who don't like tunnels: you will be able to avoid the longer ones (more than 100m). Albi is a beautiful, Southern Italian like town along the Tarn river. With its famous architecture, alike Toulouse, from which it is only 75 kms away, its cathedral, of the times of the Cathar and its Museum Toulouse Lautrec it is a perfect start and end for a family cycling holiday. Restaurants and hotels in this trip are of excellent quality. 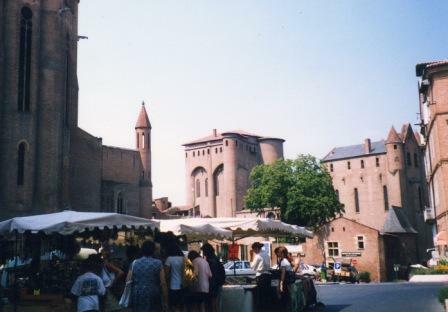 Albi, UNESCO World Heritage Centre. 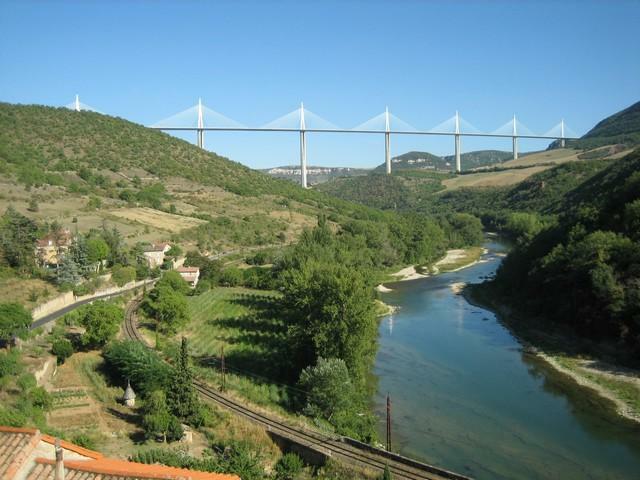 On your way to and from Millau you will ride under and above the viaduc de Millau. You will be cycling daily 50-60 km average (a sporting tour is with max 100km daily is possible too) through the friendly Valley of the Tarn. Near Broqui? you can make a canoe trip. In Albi and Millau you will stay in a ** B&B Hotel. For booking this tour we ask you to complete our booking form. The old medieval villages and towns in the gorges des Raspes du Tarn on your way will add to your feeling connected with ancient times. Not included: Lunches. Price of lunches (take away picknicks) : 8 - 12 EURO. Click on the links above for all details on the other two packages. Bags transfers included in basic rate. Basic rate: in € p.p. double room, sharing. Lunches are not included. The price of a take-away lunch varies from 9 to 13 Euro. You can order it from the hotelkeeper the evening before departure. Supplement twin rooms (with 2 beds): €3 per night per person. Solo all-in: add 70% at basic rate. Supplement single room included, bike rental not included. Parties of 3 persons : 10 % p.p. Parties of 4 persons : 15 % p.p. Parties of 5 persons : 18 % p.p. Parties of 6 persons : 21 % p.p. Parties of 7 persons : 22 % p.p. Parties of 8 persons : 24 % p.p. Albi ** B&B, arrival day . Castelnau P?ayrols ** Chambre & Table d'H?es. pool. Number of kms indicated is the minimum you'll bike. The route descriptions will also provide longer tours for each day if you wish.